Some animals are so cute that you just wish you could take them home with you and keep them forever. This list is full of those kinds of cute critters. I bet you have never seen half of these before. Prepare for cute overload. With a name that means "Earth Wolf," the aardwolf is a cute little critter. The live in burrows and eat bugs. Tons and tons of bugs. You can find this cousin to the hyena in the southern and eastern portions of Africa. If you attend the University of Cincinnati you know these cute little guys by another name, the "Bearcat." These omnivores eat pretty much everything and while their name might say otherwise they are in no way related to cats or bears. Elephant Shrews are cute little creatures that get their name from their long trunklike nose that they use to dig up bugs for dinner. They are found in the wild exclusively in Tanzania and Kenya. 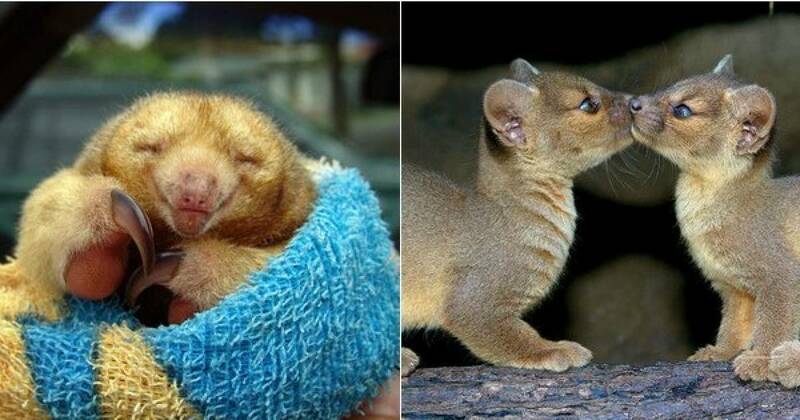 Fossas are possibly the cutest little cat otters you will ever see. They live in Madagascar and eat mostly lemurs which they tear apart using their retractable claws. At any given time while traveling around the cities of Australia you will probably run into the Golden Brushtail Possum. They are like raccoons in America in that they are seen as dumpster diving pests. If they are pests they are the cutest little, stuffed animal looking pest ever. The South African Golden Mole is an amazing little creature. They live underground so they don't need eyes which is why they don't have any and their ears are so small you might think they didn't have any either. Their claws allow them to move through sand as easily as a fish in water. Neat. These little kitty bears are related to raccoons. You can find them roaming around the forests in the Andes. Finally, we reach the cutest critter on our list. The Silky Anteater is the tiniest species of anteater in the whole world. You can find them in South and Central America.